On Tuesday, September 11, 2018, Deputy First Class Dale Smith of the St. Mary’s County Sheriff’s Office responded to a report of a hit and run accident involving a juvenile. The juvenile victim advised at approximately 4:30 p.m. while riding a bicycle in the area of Miley Drive and Joy Chapel Road in Hollywood, the victim was struck by a vehicle. The victim was knocked onto the ground, and sustained minor injuries. 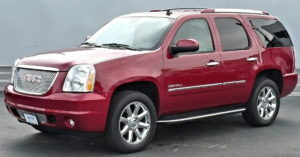 The victim described the vehicle as a red GMC Yukon, similar to the vehicle pictured. At the time of the accident the vehicle was operated by a black male, accompanied by a black female passenger. 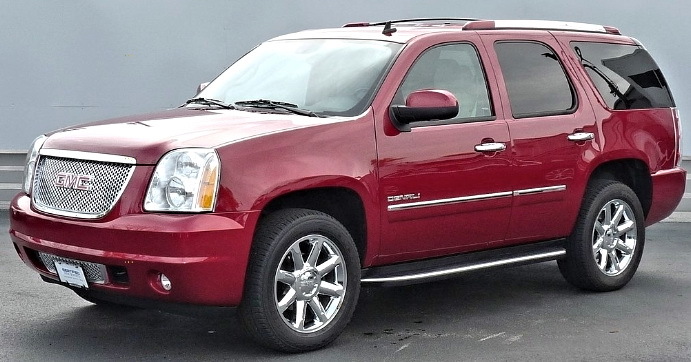 After striking the victim, the vehicle fled on Joy Chapel Road, towards Hollywood Elementary School. Anyone with information about this incident is asked to contact DFC. Smith at (301) 475-4200 extension *8098, or by email at Dale.Smith@stmarysmd.com. This entry was posted on September 12, 2018 at 3:29 pm and is filed under All News, County, Crime Solvers, Law Enforcement, More News, St. Mary's News, St. Mary’s County Crime Solvers, z 600X120 Top Ad Bottom, z 600X120 Top Ad Top. You can follow any responses to this entry through the RSS 2.0 feed. What! You mean they didn’t stop! The driver was not removed from their vehicle and given a beat down. What’s the world coming too? I thought of the same thing! In this neighborhood, everybody was at work. I hope a follow up report will detail the apprehension of this cowardly POS. No doubt the driver was DUI and didn’t want to be discovered that way. Very fortunate this victim was not hurt worse. Turn this criminal in and let him MAN UP!